This is not the most upscale pasta salad recipe, but whenever I serve it, it disappears. Maybe because it doesn’t contain any potentially undesirable ingredients (like vegetables! ), it’s a kid favorite. It’s almost like the salad version of macaroni and cheese. 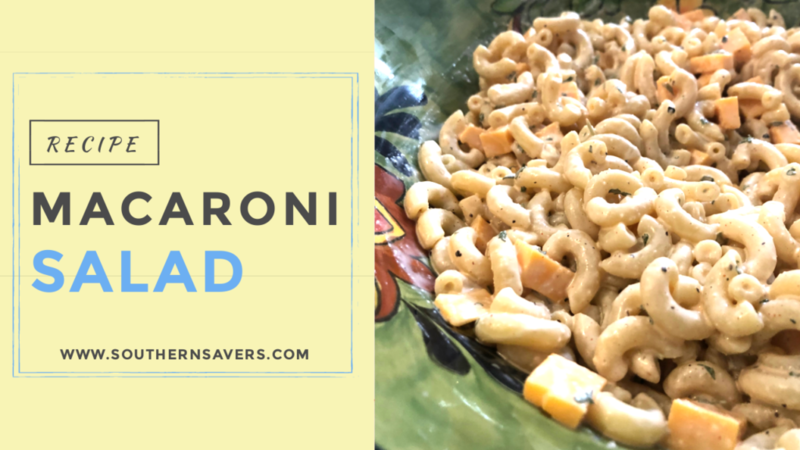 Our macaroni salad recipe doesn’t have to be made with macaroni, of course, but I like the way the pasta and the cheese cubes are approximately the same shape. It also works well with shells or other small pasta shapes that can get the creamy dressing all down in the nooks and crannies. This macaroni salad recipe also works as somewhat of a blank slate for other ingredients. I’ll sometimes add diced onion or celery, and small bits of ham or pepperoni are also delicious if you want to make it a bit heartier. Some people in our family aren’t huge fans of olives or tomatoes, so I don’t usually add those, but if you like them then I think it would be a great addition. If you want to make it ahead of time, I recommend mixing up the dressing portion separately (mayonnaise, mustard, and spices) and adding it right before serving. The longer the dressing sits on the pasta, the more the pasta soaks it up, and it will lose some of the creaminess that makes it so enticing. Cook macaroni pasta according to package instructions. Drain in a colander and rinse with cold water. Place pasta in large bowl and add mayonnaise, mustard, and spices.Stir to combine. Add in cheddar cheese cubes and stir. Add more salt and pepper to taste, if needed. This tastes fine served as is, or you can chill it before serving. You may need to add another tablespoon or so of mayonnaise before serving to get back to the desired creaminess. Because my dad was the one who introduced this macaroni salad recipe to me by making it frequently during the summer when I was growing up, I always get a bit nostalgic when I make it. When I serve it with grilled chicken and we eat outside on the deck, it makes me feel like a kid again! A somewhat similar recipe (though a bit less kid-friendly) is this American Macaroni Salad Recipe, which is also delicious!